Amazon has introduced Dash, and as this feel-good video implies it’s only just another way to keep your family happy. It’s promoted as being for use with Amazon Fresh, their grocery business. Now I still quite like walking to the supermarket, but I can definitely see the appeal of this thing. Remember the suggestion that your fridge would automatically reorder milk when you were getting low: the Dash requires you to press a button while pointing at the item, but it’s surely a step on that road. Even if it is meant for grocery shopping, I don’t suppose there’s any law against taking it with you when you go to Barnes and Noble, or the library (or the shoe store, the clothing store etc.). Maybe Amazon have it disabled for use with book barcodes, but that would be simple to change. The Amazon smartphone has been received as merely “a shopping machine”. Maybe we just have to accept that retailing is going to change, though I’ve not seen anyone with a Dash pointing at things in the supermarket yet. Of course, we have to recollect, post-Snowden, that this’d mean the contents of your fridge being known to, and perhaps analysed by, the National Security Agency. Perhaps there are still enough people who actually want to go into a store. No question where the economics point though. That’s a potent driver. 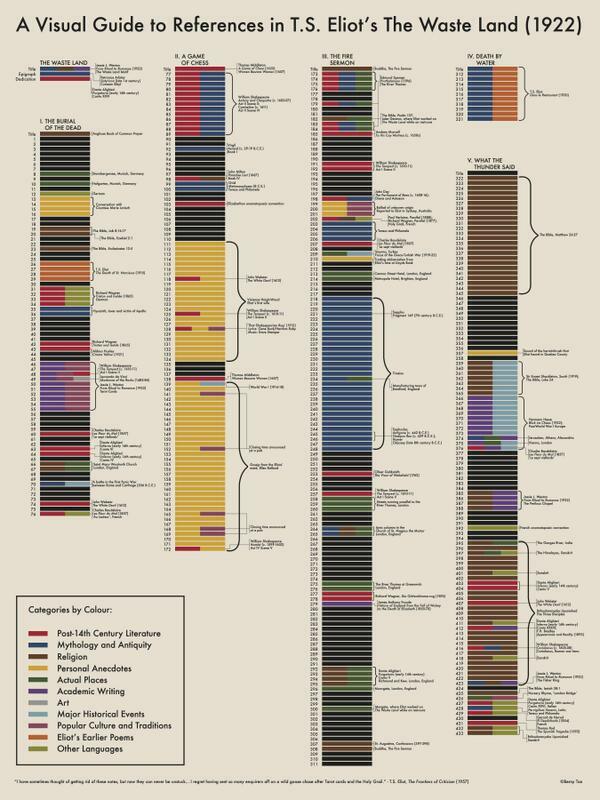 You almost certainly can’t read this infographic created by Berny Tan. Follow this link to his website, where the original can be significantly enlarged by clicking on the image. What can one say? Thomas Ehgartner’s book architecture exhibit looks most inconvenient: who could walk across that floor without falling flat on their face? 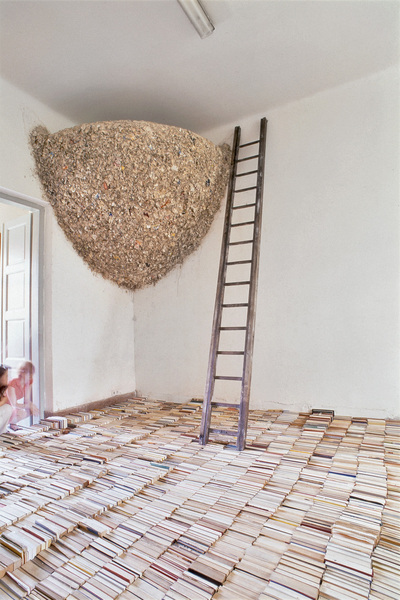 (From Book Patrol, 15 June 2014) As Ehgartner says “the current state of information overload that permeates much of our waking life becomes the foundation for creating a ‘limited archive from a infinite whole. '” Got it? Lots of water would be removed by the action of the screw press, but even after that there was too much moisture in the sheets. They would be hung up in a drying loft where they would dry out. The Iowa video attached to Paper making by hand 4, indicates the difficulties in drying the paper, and Professor Bartlett speculates that the drying loft was probably above the paper mill and would receive the moisture from the manufacture of the next batch of paper, preventing the cockling which would result from too much drying. 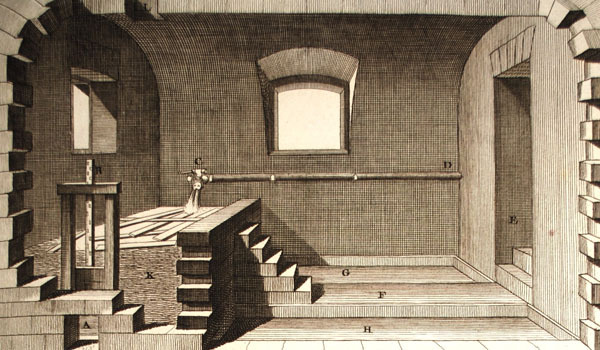 The sheets would be hung in spurs, groups of seven or eight sheets, and the loft would be arranged so that the breeze would hit the sheets side-on not end-on which would have tended to separate the sheets and encourage cockling. After drying in the loft, the spurs would be sent for sizing. Sizing would strengthen the sheet as well as improving ink hold-out. The principal material used for sizing in Europe was gelatin, taking over from the earlier starch size common in the Muslim world. Processing the “scow” for size was doubtless a stinky procedure. “In the good mills the scrow of chamoisers, tawers and whiteners is used by preference. Since they use only the skins of kids, lambs or sheep it is what is known as the “brochette”; the size made from it is clearer than when supplies are taken from tanners who deal in cow, ox or calf hides. Care must be taken to full and wash them well, to rid them of the lime dust which deteriorates and dulls the size. That which is made from tanners clippings is strong but it diminishes the whiteness of the paper. The clippings of sheep skin that the fellmongers and chamoisers sell, gives a size which is whiter than the other but it is not so strong. 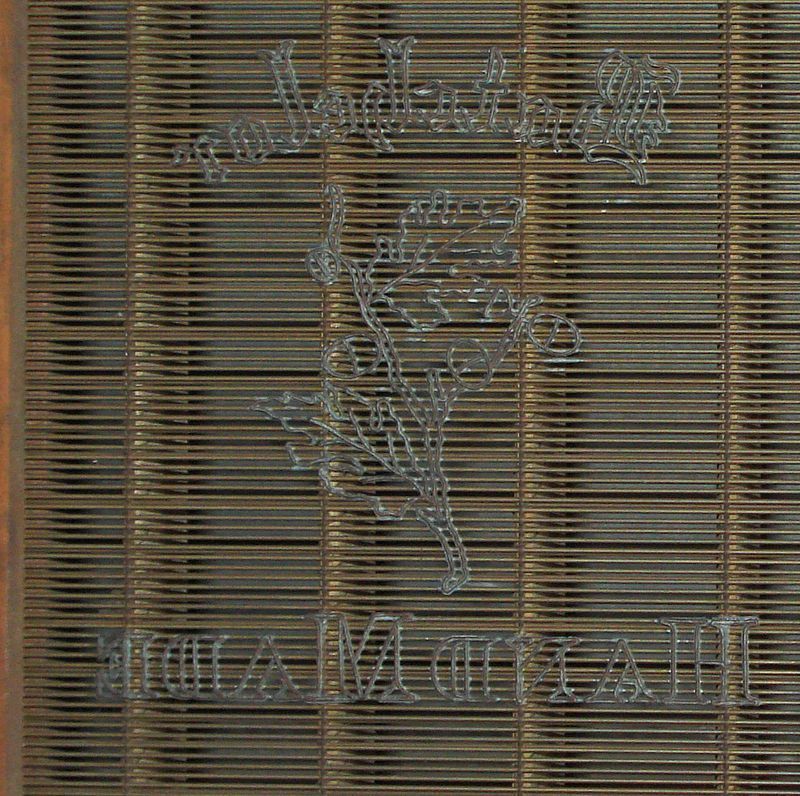 For good quality papers parchment clippings are also used.” (Lalande, 1761). The scow would be boiled down for 36 to 48 hours to create the gelatin, which would then be let stand to clarify. 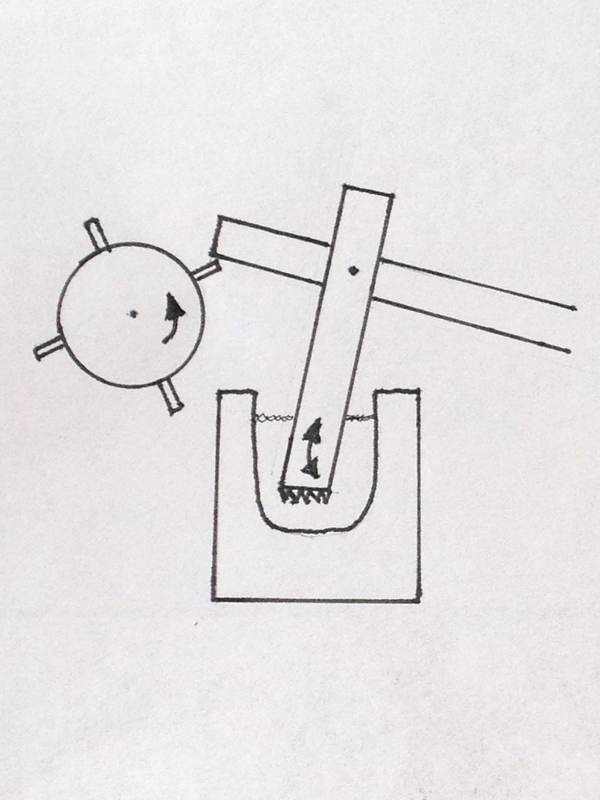 Spurs of up to 50 sheets would be bathed in a vat of gelatin, fanned open at one end, and then at the other. After sizing they would go back to the drying loft where they would be hung to dry as individual sheets. The paper would finally be packed in quires of 24 (or 25) sheets, twenty of which made up a ream. In the ream were 18 folded quires of paper and 2 “retrees” or seconds which were placed top and bottom as protection. The ream was covered with heavy sheets of coarse paper folded to wrap it. The top wrapper would carry a printed design identifying the type of paper and the maker, or maker’s agent. The pressed and wrapped ream would be tied with rope, and ten or more reams made up a bale for shipping. Few wrappers have survived, and those that did owe their survival to thrifty notaries who would reuse them as file folders. 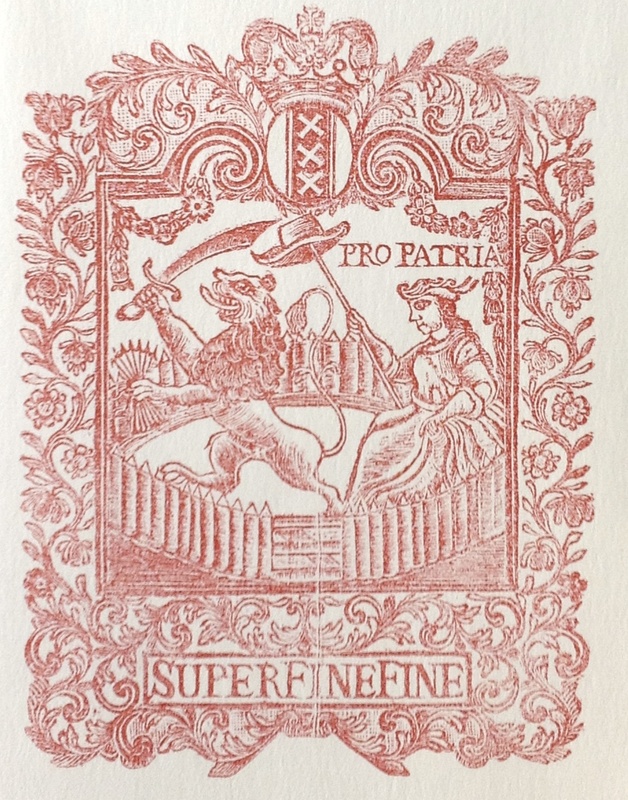 The wrapper design below is from an unidentified Dutch mill, and incorporates at the top the arms of Amsterdam. 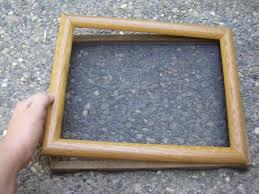 Paper making may have been invented in China in 105 AD. By 795 AD there appears to be evidence of a paper mill in Baghdad. 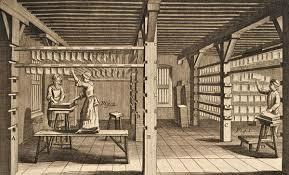 Gutenberg’s invention of printing from moveable types is what gave the use of paper its big boost in Europe. From then until the beginning of the 19th century the process of making it remained relatively stable. 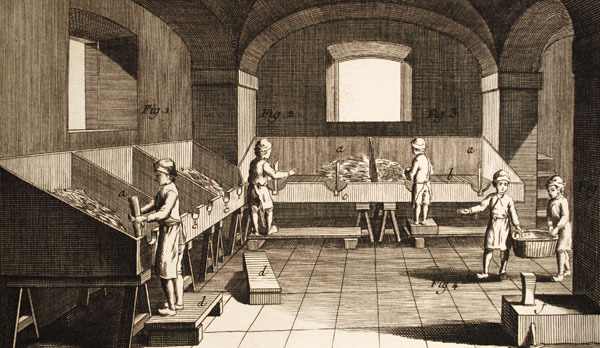 There are four basic steps in making paper by hand. First the pulp preparation, then the sheet formation, next couching (pron. 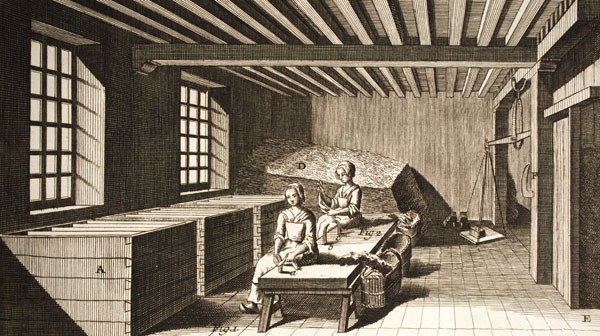 cooching, from presumably the original French), and finally laying/drying. If the paper is to be used for writing or printing, another phase, sizing, will be added. Till the early 19th century the raw material was flax, hemp, linen and more rarely cotton fibers, mainly derived from cloth rags, collected by rag and bone men. At the paper mill the rags would be sorted into grades. 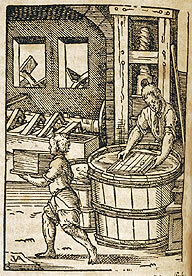 Sorting was key to success in making fine paper. Much depended on starting out with consistent raw material. Then the rags would be cut into small pieces and buttons, pins and other extraneous material removed. After that the pieces of cloth would undergo retting — fermentation — to soften up the fibers. They might be left to this rotting process for about a month. 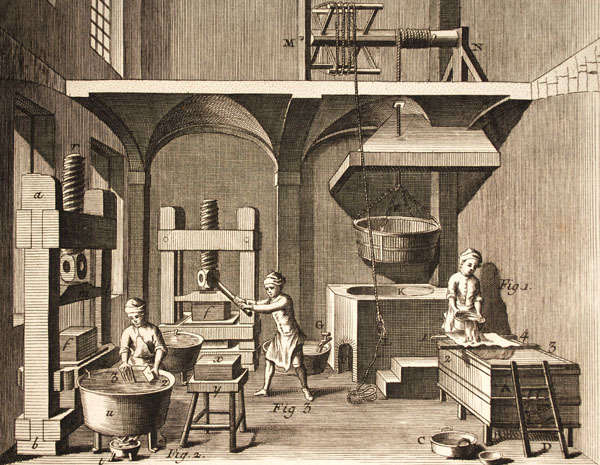 Only in the 19th century was cooking with chemicals introduced to replace retting which had relied on the action of local enzymes whose existence was obviously a mystery to the craftsmen who guided their action. 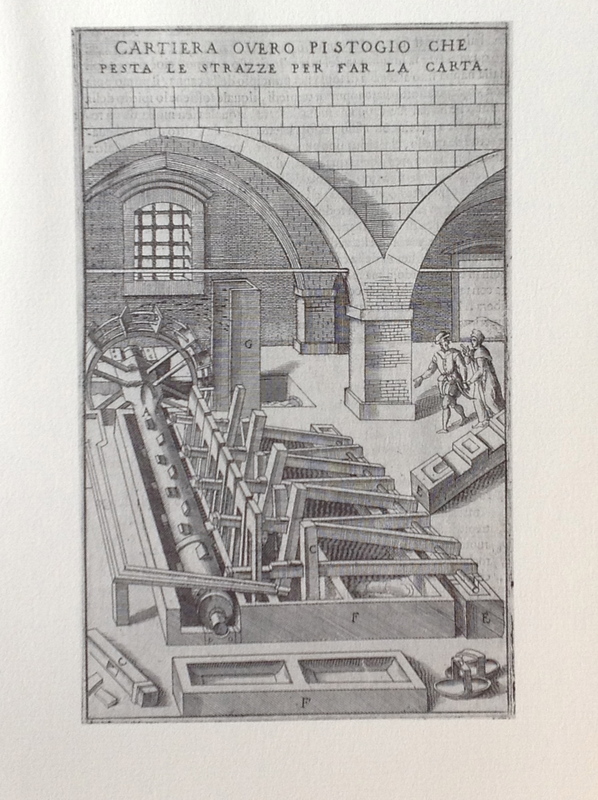 After retting, the stuff, mixed with water, would be fed into beaters, where the material would be broken down by the action of hammers stamping them to separate the fibers and to break up their outer surface so that they would adhere better in the final paper sheet. There’s clearly a category of publishing called “Young Adult”. Whether there’s any way of identifying a YA book from its content alone is hard to know. It’s also hard to tell by the readers of such books. Lots of adults read the Harry Potter books, and The fault in our stars is being read by all these days. So what does YA mean? Is Little Women a YA book? What about Sherlock Holmes? Jane Eyre? Dickens? Obviously the answer to all is, No, they are not YA books. YA is in a way just a label applied a book to facilitate shelving in the bookstore — it’s a signal to bookstore clerks, book buyers, and librarians saying “Hey. You might be able to interest a teenager in reading this.” Little Women et al were published long before such a label was invented. The fault in our stars, once you hold it in your hands doesn’t shout “Young Adult” at you. There’s a conventional YA cover style, which this one has eschewed. The only hint, beyond the fact that the first line of the text places the main character in her 17th year, is the website reference on the back cover which refers you to http://www.penguin.com/teens. Of course as a teenager you wouldn’t need any such indications, since that #1 marketing tool, word-of-mouth, has already alerted you to the book’s existence. One of our granddaughters turned my wife on to it. I’ve not read it yet. When I was a teenager I would have refused to read any book designated as being for Young Adults. There is a whole heap of condescension implied in the term: “Here, kid. You aren’t up to the real stuff — read this and that’ll keep you quiet.” But of course that attitude is rubbish — any teenager (with the time to spare) can get a whole lot out of War and Peace, Middlemarch, Our Mutual Friend, Les misérables, Wuthering Heights. So why should an adult feel embarrassment at reading Harry Potter and the Philosopher’s Stone, or The Giver by Lois Lowry? Yet people always sound a bit apologetic when reporting having enjoyed such books. Ruth Graham writing in Slate says adults should be embarrassed at reading children’s books. “At its heart YA aims to be pleasurable” may be true. Safe and pleasurable are not awful things, but maybe they are not enough. But we don’t have to be always engaging with the most elemental forces — safe and pleasurable are just fine some days. Tomorrow I’ll engage with elemental. The people who say we should be embarrassed at reading YA, probably think we shouldn’t be reading any genre fiction either, no romance, no sci fi, no mystery: just a continuous diet of literary fiction, academic monographs and original historical records. Get out of here: we’ll read whatever we want! Alyssa Rosenberg, pop-culture opinions blogger for The Washington Post, appeared on WNYC’s The Brian Lehrer Show this morning. Listen here. As she says “I’d never say the world is complete through a children’s perspective, but I’d also never say it’s complete through the eyes of John Updike either”. No harm in reading anything. 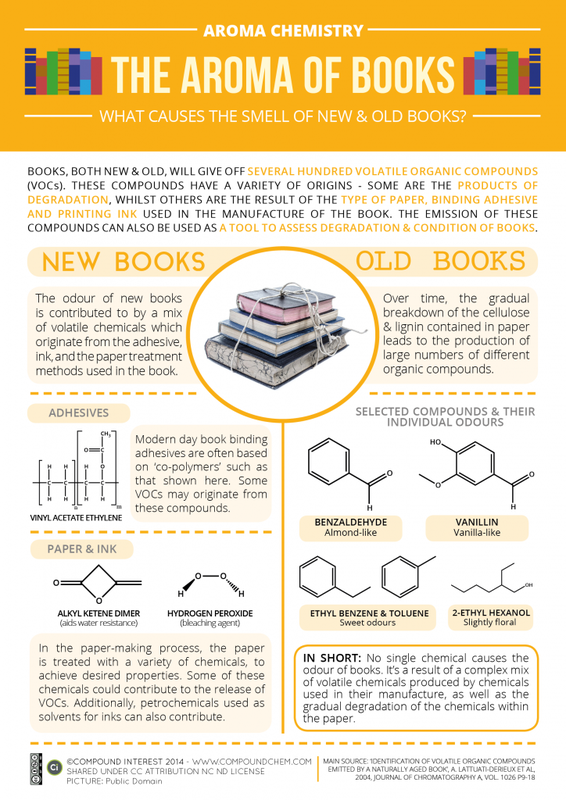 Compound Interest: Everyday Explorations of the Chemical Compounds provides this infographic about the smell of books, and a full discussion, with references, of what’s going on when books release their odors. This subject constantly fascinates me. Previous posts are Smell of a book and Smell of a book, 2.